I took a train at about 5:00 a.m., it is very early morning... to leave for Spain by an airplane today. I arrived at Santiago de Compostela via Madrid in the afternoon. After I checked in my hotel, I walked around and bought mineral water and some snacks at a shopping center. The weather is not so hotter than I thought but cool. So it is comfortable for going around. Then I went to a spanish restaurant to take a dinner. The interior design of the restaurant is very interesting. 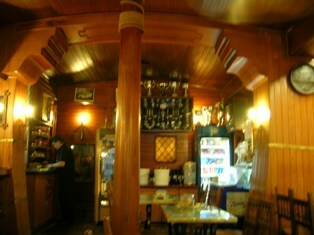 It is like an inside of an old wooden ship. 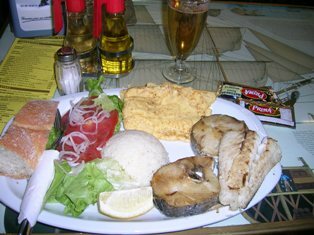 I took a fish plate. Copyright © Somewhere in Time-Space Coordinate All Rights Reserved.